This year’s program is a rich mix of films, speakers, a workshop and informal events, always with the right amount of fun, with the help of our partners IHE Delft and Deltares. 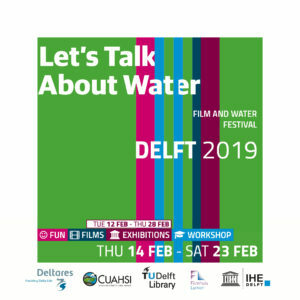 New to Let’s TaLk about Water are two exhibitions and a sustainable fashion show, thanks to the inspiring dedication of the students of the Zadkine College in Rotterdam, the TU Delft Library and IHE’s Open Water Diplomacy Lab. We begin our festival on Thursday 14 February with the opening of a photoexhibition in OPEN (city library) called #EverydayNile and the launch of an online media campaign with the same name. It’s followed with our traditional Nile Saturday (16 Feb) addressing the religious aspects of water. The core of our filmweek starts on Monday 18 February with the Japanese cult classic Woman in the Dunes, which pits a man’s ego against the forces of nature and destiny, and too little water. Tuesday starts with a workshop for professional communicators on The Power of Film. That evening kicks off our sustainable fashion theme with the film RiverbLue, a wake-up call-to-action about pollution from an industry that blinds us with glamour and our own vanity. The next day in the TU Delft Library students show what sustainable clothes look like in a special fashion show. That evening another cult classic, Ridley Scott’s Bladeruner infuses a water drenched landscape with characters unable to decipher real from unreal. Thursday we combine two films about agriculture in a relaxed evening in the Falie Begijnhof Theater, with Cowspiracy and Good Things Await, a contrapuntal dance between the extremes of big business and corrupt government, and the spiritual side of biodynamic farming. The last evening is reserved for Woman and The Glacier, which looks at the painstaking and solitary patience of a dedicated scientist. On Saturday afternoon (23 Feb) we wrap-up our festival with the special documentary Dawson City: Frozen Time showing how the perma-frost preserved our disappearing heritage of nitrate and celluloid, the material dream factory of lost film. After our program you can continue your cinematic journey on Tues- day 26 February, with a screening hosted by Students4Sustainability with From Source to Sea, with a look at our consumerism run amok (with the director present). We wish you lots of fun and inspiration!